“Never Turning Back: The World of Peggy Lipschutz” is a film about 88-year-old artist and political activist Peggy Lipschutz of Evanston, Ill.
Lipschutz and her “chalk talks,” sometimes called “Songs You Can See,” have been part of the many struggles of Chicago’s labor, antiwar and civil rights movements since the 1960s. Her illustrations have become synonymous with messages of worker unity, democracy and the fight for justice. The goal of this new film, currently in production, is to celebrate the life and work of this unique woman and reveal her lifelong commitment to art and social change as an inspiration for the next generation. The film will cost approximately $50,000 to finish. The filmmakers are approaching both individuals and foundations to help bring Lipschutz’s story to life. They have raised approximately half of the needed funds and need an additional $25,000. For additional information, contact Jerri Zbiral, producer/director, (847) 328-6994 or jerri @thecollectedimage.com. 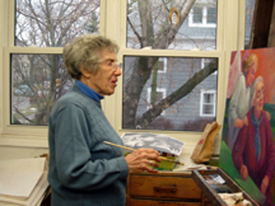 To read Susan Webb’s feature: The World of Peggy Lipschutz: Women, workers, angels — soul of her purposeful art, click here .